I grew up in Ballinrobe, but a few years before I was born, the train service was discontinued. The improving road network and a variety of other facts meant that the steam train that could bring you all the way from Ballinrobe to anywhere, sending smoke through the rural countryside, was a sight not to be seen again. In its heyday, people travelled on the trains from the west to the resorts like Kilkee in Clare, the sound of Percy French's Are ya right there Michael, are ya right', ringing in their ears. And that was all lost to progress. When one thinks of what was lost when the Galway to Clifden service was discontinued, you have to cringe. Imagine the cultural and economic possibilities of that service were it there today. Imagine that train puffing its way through the valleys, past the lakes, over the rivers and arriving in that town in the foothills of Connemara. Imagine how many tourists per day would travel on it in the peak season, how more vibrant places along that route would be. How much less traffic there would be if people could travel westwards without having to resort to single occupant cars. Here in Mayo, we do not need the benefit of greenways to be outlined, because we can see how ours has transformed the Mayo touristic economy and become a trailblazer for other locations in the country. 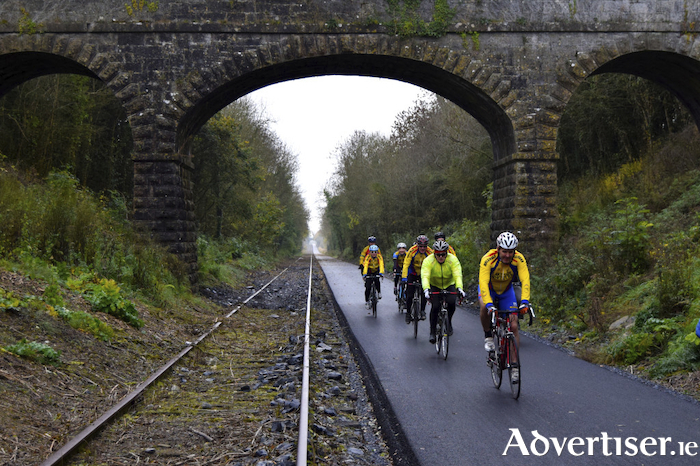 However, in the next two weeks, Galway County Council will decide on whether or not to engage a feasibility study on whether the Tuam-Athenry Quiet Man greenway is a runner. Developing a route along it is not going to deter plans to ever re-open it, CIE has confirmed this week, as it always retain the right to change the use of the tracks if it is ever needed. In a past life, I worked on marketing the concept of Westrail in Tuam, with its drive of preserving the steam trains and the tracks that carried them, so the stations and platforms along the way are familiar to me. In recent times, there is a drive to use those railway lines to act as greenways to allow people to cycle, to walk, to run along them, to bring people into areas of the countryside they never have been. The trackside one from Athlone to Mullingar is fantastic. It is safe, off-road, quiet, and respectful to the still existing but dormant rail line that runs alongside. As you cycle you are cognisant of the history of the route, and of the possibility that one day in the future, if it was ever deemed prudent to reopen it, that it could be done. The towns and villages along Mayo's greenway have earned millions from what it brings in. It rejuvenates communities, it creates new businesses. Bike hire, bike repair, cafes, restaurants, guesthouses, hotels, physiotherapists, adventure. And all from a clean, efficient, and respectful industry. Galway's county councillors will sit down to approve (or not ) a feasibility study on the greenway next week. It seems to be a no-brainer. With the CIE letter, they now do so knowing that they are not shutting a door on history, but opening one on a project that will revitalise the rural points along this route. Last week, the Government announced a €53million pot to fund these greenways. Prevarication could cost communities on this one, if they do not get our noses to that trough. By promoting the physical health and wellbeing of our society, while being respectful of the past, these greenways can be a boon in so many ways. The future of the west will be enhanced by the development of a network of greenways across Mayo, Galway and Roscommon, interconnected and cross-marketed. Let us hope that this progress is not impeded by waiting for a train that will be a long time coming.